Not breaking the fourth wall in poetry is a time-honored tradition challenged by very few poets. One of the most notable and successful examples is the Candian poet and singer Leonard Cohen, who transgressed against this taboo with wonderful results in his book of poems The Death of a Ladies' Man. The juxtaposition of the narrative with the incisive analysis, or expansion of the narrative at the idiosyncratic level by the poet himself adds a power and depth to what are already magnificent poems. Cohen's poems were brought to mind last evening when all my Earthly duties had been fulfilled, and I decided to use the remaining moments of the deepest part of the night to luxuriate by writing a poem. 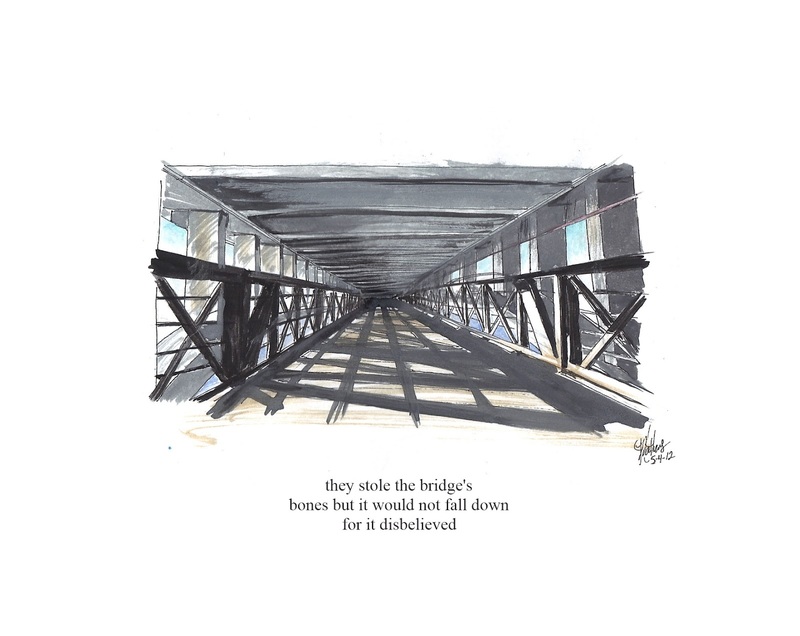 Little did I know I wasn't writing a poem at all, just taking dictation from myself as I had written the poem earlier that day crossing the footbridge under Jefferson Street Bridge. March 1, 2013 update: I recently was asked to do a rather significant archiving project for the town I live in, a history of recent poetry. Jenny is designing a banner for the project, and this very bridge is involved.